Immediately following the Civil War, Thomas Cook founded Logan Manufacturing Co. and began operating a yarn and twine mill here. The picture above dates from that time. The name was changed to Oakdale Manufacturing Co. in 1873. The 1860’s wooden dam must have been replaced about 1900 with a stone dam (see photo below). The frame mill building was rebuilt in brick in 1889 under the leadership of Joseph Ragsdale and his wife, who was the grand-­daughter of Thomas Cook. The mill is still owned by the Cook & Ragsdale family. The Greensboro News & Record featured this mill in an article “Unraveling the Past” in the February 19, 2009 paper. In 1848 a number of area businessmen founded a cotton mill called Union Factory. By shortly after the Civil War, George W. Swepson (also the owner of the Falls Neuse Mill in Alamance County) sold Union Factory to John Randleman and the name of the location changed for good. Randleman had long worked in the cotton mill business and was at one time manager of the High Falls Cotton Mill on the Haw River. The Randleman factory burned in 1885 and was rebuilt. Randleman Manufacturing Company later came to own numerous textile mills in the area including Naomi Falls. The mills were sold to Deep River Mills, Inc. in 1911 and were auctioned in 1933. The Naomi Falls Manufacturing Co. built this mill in 1880. There is a 200 year old legend about a tragic event that occurred here: The orphan Naomi Wise lived near Randleman. Though her guardian, Mr. Adams, took his responsibility seriously, she was very poor and had few material possessions. Prior to 1808, Wise made the acquaintance of Jonathon Lewis. A romantic relationship developed, the two meeting secretly, as Mr. Adams did not approve of Lewis. Eventually Wise became pregnant, and told Lewis, who was not opposed to marriage at first, but that changed when his mother found out about his plans to marry the young orphan girl. She wanted her son to marry someone higher on the social ladder. Mrs. Lewis convinced her son to terminate the relationship, but Wise’s pregnancy made that problematic. One April night in 1808, the couple met as they usually did, at the spring in New Salem which is now known as the Naomi Spring. Wise mounted Lewis’ horse, riding behind him, on what she must have thought was a trip to the magistrate in Asheboro. When the two made their way to the ford across Deep River, Lewis stopped the horse midstream. He then pulled her dress above her head, immobilizing her arms, and drowned her in the Deep River. The next day the body was discovered below the old mill dam in the rapids which became known as Naomi’s Falls. People quickly realized that Lewis was the culprit, but he had already fled to the Ohio wilderness, where he remained for several years. In 1815, two men from Randolph County went to the Ohio River country and apprehended Lewis. They brought him back for trial, but he was acquitted for lack of evidence. Legend says that Lewis later admitted to the crime in a dramatic deathbed confession when he died just a few years afterwards. He supposedly gave many graphic details of the final moments of the life of Naomi Wise. Former N. C. Gov. Jonathan Worth and his family built this mill in 1881. This stone dam is 17 feet high with no mill race. After his public service, Gov. Worth ran several businesses in Randolph County. In 1916 several Asheboro businessmen bought the company and renamed it Sapona Cotton Mills, Inc. The Central Falls cotton mill was originally built in 1881 and came to be owned by the Worthville Manufacturing Company. The wooden dam here was 9 feet high and backed water all the way up to Worthville Manufacturing’s other site at Worthville. When the Worthville and Central Falls mills were both owned by the same company, a boat was used to ship goods between the two mills and passengers sometimes traveled on the boat as well. The mill is still present just below the Old Liberty Road Bridge, but the dam is apparently buried beneath the backwaters of the Cox Lake Dam. In 1914, Central Falls Mills, Inc. was formed and ran this mill. Benjamin Elliott acquired this site in 1801 and built a gristmill and sawmill. Later the Elliott family partnered with the Horney family to establish the first cotton mill in Randolph County in 1836. Jonathan Worth, Hugh McCain, and Jessie Walker were also involved in the establishment of this company. Collectively, these same men were the essence of the Whig Party in Randolph County. The 1836 dam was still standing in 1880. The Elliotts branded their yarn and cloth with the Cedar Falls name, becoming the Cedar Falls Manufacturing Company in 1846, housed in a three­story brick building. The dam was built in three sections using two islands in between and varied between 7 and 10 feet high with a half mile long race. Cedar Falls Manufacturing Co. built a second mill and dam in 1895 just a bit downstream of the first mill, and this was known as the lower mill. In 1916 the company was foreclosed upon and reopened as the Sapona Cotton Mills. In 1939 the upper mill was sold to the Jordan and Odell families of Saxapahaw (J. M. Odell having learned the cotton mill business in this same mill as a young man); the lower mill was still operated as Sapona Manufacturing, specializing in synthetic yarns. Jockey underwear company bought the mill in the 1980s. The mill closed in the early 2000s and is now used to store textile machinery overflow from the American Textile History Museum, Lowell, MA. Mac Whatley, a resident of the area and a member of the Board of the ATHM kindly shows people through the collection. In 1820, Christian Morris sold his gristmill to Elisha Coffin. Coffin with partners Henry B Elliott of Cedar Falls, John Miller, and Henry Kivett built a cotton mill in 1838. That mill burned on April 18, 1851, but was rebuilt and sold to the Cedar Falls Manufacturing Company. The mill sold twice in the mid 1870’s to the Randleman Manufacturing Company and then to the Moffits who formed the Franklinville Manufacturing Company and renamed the town in honor of Jesse Franklin, North Carolina Governor (1820 to 1821). 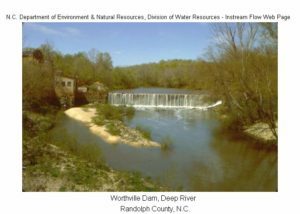 The 20 foot high dam is still used by Bill Lee of Asheboro as a hydroelectric plant. Island Ford Manufacturing was organized in 1845, by the turn of the century the mill had passed into the hands of the Randolph Manufacturing Co. The dam is now in ruins and the foundation of the former mill building is still apparent. The 1990 movie ‘Escape’ features scenes of the Randolph Manufacturing Company Mill #2 back in the day when the building was abandoned, but still standing. 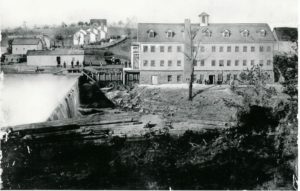 In 1850 the hamlet of Allens Falls had its sawmill converted into a cotton mill by the Columbia Manufacturing Company and the town became known as Columbia. A 12­-foot high stone dam was built about that time and it is apparently the same dam that stands there today. William Watkins purchased the cotton mill in 1879 and renovated it, renaming the town Ramseur. Foust’s Mill was purchased by the Enterprise Manufacturing Co. in the 1870’s. There was a devastating fire at the mill here in 1881 and the site was built into a cotton mill in 1883. The Enterprise Manufacturing Company’s 4­foot high mortared stone dam was with a concrete dam in 1918. Today this site is operated as a hydroelectric plant by the inimitable Bill Lee of Ramseur, NC. The High Falls Cotton Mill was owned by the Woody family and was probably built some time in the 1880’s. The dam was apparently highly modified in the early 20th century. Hydrodyne Industries still generates hydroelectric power here. The huge abandoned textile mill building still stands on the north bank. Oakdale Cotton web site given above. 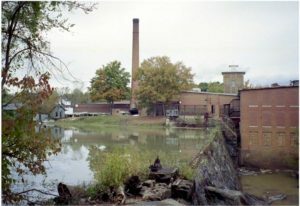 http://www.deepriverheritage.com/ is devoted to the history of the Deep River basin. With thanks to Mac Whatley and Peter Metzke.